SCP-734 during a "Play Time" period, before the installation of arterial catheter. Special Containment Procedures: Any staff entering the containment area must be in contained atmosphere haz-mat suits. No physical contact is to be made with SCP-734. Anyone making physical contact with SCP-734 is to be immediately removed from the containment area and placed in quarantine for observation. Any items exiting the testing area must be sterilized before being allowed to exit the containment area. Blood is to be drawn via arterial catheter once daily, the amount to be determined and re-evaluated monthly. Catheter is to be cleaned and maintained three times daily. Blood drawn is to be immediately sealed and the container sterilized before cryogenic storage. Blood may be stored for five years, after which it is to be incinerated. Requests to use drawn blood must be submitted to Overwatch. SCP-734 must have a handler standing by at all times in full haz-mat gear who is to be rotated every four hours. Interaction with SCP-734 is allowed only when in full haz-mat equipment. SCP-734 is to be changed and fed as needed with nutritional requirements reviewed and adjusted monthly. SCP-734 may be given toys with clearance from Overwatch. Description: SCP-734 appears to be a male human infant between seven and eight months of age. SCP-734 shows normal development and health for a child of his age and genetic background. No abnormal genetic mutations, infections, or rare cellular disorders have been found during any test, and no origin point or cause has been found for the effect SCP-734 has on human tissue. Any human tissue making contact with SCP-734 will begin to rapidly break down and “flake” away. This effect is most often triggered by skin-to-skin contact, but any living SCP-734 cell can cause the effect. This “flaking” will begin at the point of contact two hours after exposure to SCP-734 and spread at the rate of 0.5mm/minute. The means by which the “flaking” occurs is unknown as no form of viral, bacterial, or chemical agents are passed by SCP-734 to the subject. Cells begin to lose physical cohesion and small patches of tissue begin to peel away in flakes. The flaking begins in the tissue layer of contact, most often the epidermis, and will attack that layer exclusively for five hours. After five hours, the effect will begin on the next layer, and continue in this manner until all tissue layers are affected. This process is extremely painful and becomes progressively more debilitating as nerve tissue, blood vessels, muscle tissues and skeletal structures are exposed then “eaten away” by the effect. No treatments or procedures short of amputation of the affected areas have shown any success in halting the progression, with amputation having a success rate of 72%. Due to the non-infectious nature of this effect and its low survivability rate, blood drawn from SCP-734 has a very high strategic value. An arterial catheter has been installed to provide a constant supply of blood samples which are currently being stockpiled and researched for possible application in Foundation activities, both covert and military. SCP-734 itself has shown above-average intelligence and physical aptitude, and proposals to train and condition SCP-734 to become a Foundation operative once it matures are under review. Nurse ████████ in initial stages of exposure. 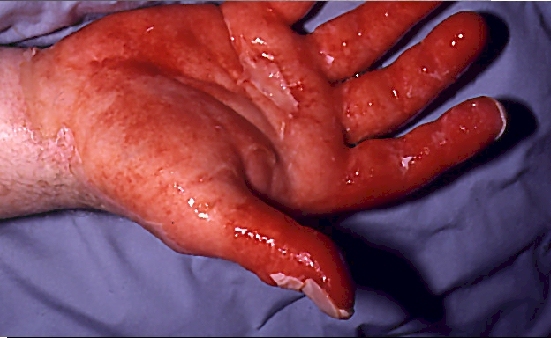 SCP-734 was recovered at █████ Medical Hospital after reports of a massive outbreak of a unknown form of flesh-eating bacteria in the maternity ward. Foundation operatives quarantined the area and found several nurses, four doctors, and one infant affected by SCP-734. SCP-734 was isolated and contained after interviews with staff. The mother of SCP-734 was not found, and no records of her discharge from the hospital were found. It is assumed that she was affected by SCP-734 during birth and died from the effect. How she was able to carry SCP-734 to term remains unknown. Memo to Handler Staff: This should not be necessary; a reminder will, however, be issued to all staff working with SCP-734 that full face masks are a MANDATORY part of the haz-mat equipment needed for working with SCP-734 and may not be removed at any time while on-duty. SCP-734 may be a baby, but it is still capable of causing a degenerating tissue disorder in anyone coming in contact with any living SCP-734 cells. This includes mucus. Agent ███████████ removed her face mask, stating “He's just a baby, I'm holding his hands, it'll be fine!”. SCP-734 then sneezed on Agent ███████████'s face, causing “flaking” to initiate from twenty-six points on her face and neck. Photographic records of the effect's progression upon her will be provided to any staff with questions or complaints related to SCP-734 and its containment procedures. Project Update ██/██/████: Testing of SCP-734 at age ██ confirms a 98% score on the Aeslinger Loyalty Index. Entity has been approved for anomalous weapons training.